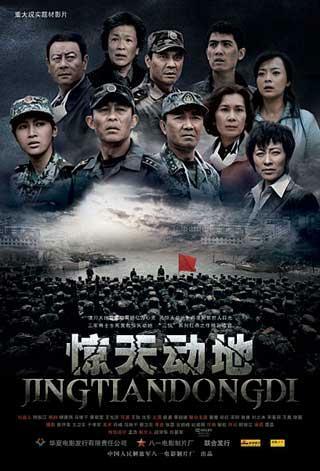 A movie depicting the May 12th earthquake in Wenchuan, Sichuan province in 2008 hit big screens across China on Tuesday. The film depicts the devastating trauma and the moving rescue afterwards. "Earthshaking" was first released last September. It garnered 100-million yuan or 14-million US dollars at the box office, and won three awards at the Guangzhou Student Film Festival, including Best Picture, Best Actress and Best Supporting Actress. It has been acclaimed by audience and critics for its vivid scenes, shaking stunts and moving storyline. This latest release features 26 minutes of video from the earthquake rescue efforts. Lead actor Hou Yong says "Earthshaking" is a film he paid the most effort too. This is also the role he is most proud of. Hou Yong, actor, said, "We were there shooting the film, when the rescue was still going on. We lived in a hotel in Mianzhu, at the quake zone. The entire city had no power, it was pitch dark at night. We lived there while shooting the film, and help the residents come back and settle down in the city. And the city regained its vigor." Yue Hong, actress, said, "The circumstances were really hard. But every night I slept well. They always told me "there was an aftershock during the night, at four or five o'clock," and asked if I was awakened by it. I never was. There was more than one hundred crew members, and many PLA soldiers surrounding me. I felt very sure we would be OK."
"Earthshaking" started screening at major Chinese cities Tuesday. During an era where quakes are common across the globe, the film is expected to draw big crowds.